The correct way to live, if you read the novel straight, seems to be “Don’t live as a young, successful investment banker from a well-off family in 1980s New York because the prevailing climate of superficiality and greed will strip you of your identity and your conception of human dignity.” That’s all well and good, I suppose, but I never have to worry about being an investment banker in 1980s New York, let alone all the stuff about being successful. On the other hand, a broader way to read the point is that we shouldn’t be greedy and superficial in any context. Well, yeah, okay. I mean, there are children’s cartoons that give us the same moral and with as little ornamentation, and it only takes like 22 minutes to tell us, not 400 pages. So obviously I was sort of not impressed with the book when I was 14. About two weeks ago, it happened that I got the flu. I was laid up in bed and could barely gather enough strength to go search for food, I skipped going to the gym, and I completely neglected my homework. What I did do, however, was reread American Psycho, sleeping in between chunks of the book for about an hour and having some pretty terrible fever dreams because of it. Anyway, I did not just reread American Psycho for shits and giggles — an acquaintance of mine who is in a position to have knowledgeable opinions on such things has told me a few times that Bret Easton Ellis is the greatest novelist of the 20th century. This is obviously a helluva thing to say, considering it means Ellis beats out Joyce, Nabokov, Faulkner, Hemingway, Pynchon, and whoever the hell else you want to name (maybe some women and people of color, as the liberal arts student in me is shuddering at the alabastar patriarchy of that list I just rattled off). That Ellis is the best novelist of the last century is the kind of claim I want to take to task, but it’s also one that’s hard for me to assess since the only Ellis I’ve read is Psycho and, as I have explained, when I did read it I was a scrub. So I am planning on working my way through Ellis’s novels, attempting to suss out whether or not my acquaintance’s claim is well founded. I figured there was no better place to start than, well, where I started seven years ago, and so I reread American Psycho. And holy cow, man, it is pretty awesome. Also: turns out it’s not a satire, and to assume it is of course produces the deficient reading I had when I was 14! Mostly. Sort of. Don’t worry, I’ll explain this all eventually. 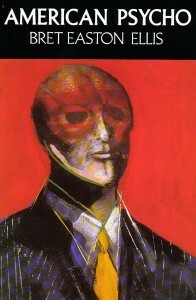 So over the next few weeks I’m hoping to have a series of short-to-longish blog entries explaining why American Psycho is success from both a literary standpoint and from the standpoint of the conscientious horror reader. This oughta be fun. Keep an eye out, because in a week or so I’ll hopefully have up a piece on exactly what Bret Easton Ellis has to do with Dante Alighieri.